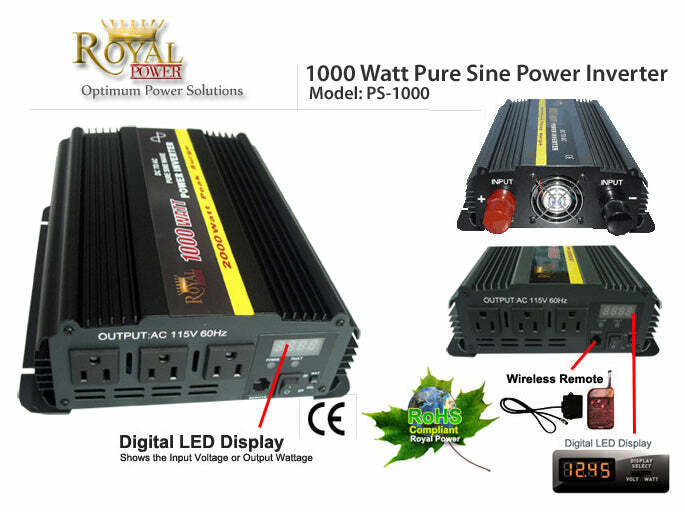 The Royal Power 1000 watt pure sine wave power inverter 8.4 amps of clean pure wave power. This unit allows you to operate all types of electronics the output wave is similar to the alternating current found in your home outlets. Pure sine power inverters are specifically made to operate sensitive medical and audio equipment. This unit has less than three percent harmonic distortion. This unit includes a digital LED wattage~battery volt meter, wireless remote system and built in cooling fan. 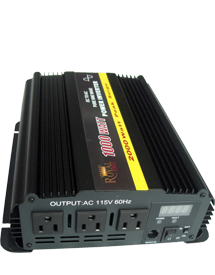 This 1000 watt inverter plugs directly to a 12 Volt DC battery to power large appliances, air conditioners, heavy duty power tools and many other electronics in your vehicle, or on a free standing 12V battery. This inverter also includes a USB port an excellent addition for battery chargers. Incandescent light, power tools, 32"TV, fridge (16 cu ft),8 gallon vacuum cleaner, 500W microwave oven.